This set of images depicts the collision between two galaxies in the early universe that may give rise to supermassive black holes, based on supercomputer simulations. The monster black holes at the heart of galaxies may have originatedfrom galaxy collisions during the earliest period of universe, newsupercomputer models suggest. Supermassive black holes ? millions to billions of times the massof our sun ? are thought to reside at the center of almost every galaxy. Astronomershave found the presence of supermassiveblack holes within the first billion years of the universe, meaning theytook much less time to form than current ideas suggest. Mergers between giant primordial galaxies are thought to have beencommon in the early universe. Simulations run on supercomputers suggest that a mergercould have formed an unstable, rotating disk of gas, which funneled gasamounting to more than a 100 million times the mass of the sun into a small cloudin only 100,000 years. This cloud collapsed to give birth to a black hole,which could then grow to a billion solar masses in about 100 million years bysucking gas from the surrounding disk. Previously,astronomers had suggested supermassive blackholes, galaxies and other giant cosmic structures had formed gradually asgravity drew small bits of matter together into larger and larger clumps. "Our result shows that big structures, both galaxies andmassive black holes, build up quickly in the history of the universe,"said study co-author Stelios Kazantzidis, an astronomer at Ohio StateUniversity. Theimplications of this new discovery are far-reaching in our understanding of theevolutionof the black holes and galaxies, Kazantzidis said. 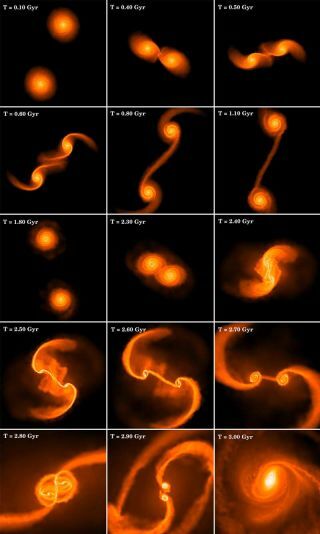 "For example, the standard idea that a galaxy's propertiesand the mass of its central black hole are related because the two grow inparallel will have to be revised," Kazantzidis explained. "In ourmodel, the black hole grows much faster than the galaxy. So it could be thatthe black hole is not regulated at all by the growth of the galaxy. It could bethat the galaxy is regulated by the growth of the black hole." One important consequence of this model is that galaxies in thevery early universe should have much bigger central supermassive black holesthan expected, said the study's lead author, Lucio Mayer, an astrophysicist atthe University of Zurich in Switzerland. In comparison, galaxies nowadaysgenerally have central black holes appropriate for their size. A number of instruments coming online in the next five to 10 years,such as the James Webb Space Telescope and the Atacama Large Millimeter Array(ALMA), are expected to be able to measure the masses of these early galaxiesand their central black holes to prove or disprove this model. ? "Possiblynew data from lots of other instruments might be able to provide an answer evenearlier," Mayer told SPACE.com. Thesenew findings also could help astronomers better uncover enigmatic gravitationalwaves. According to Einstein?s theory of general relativity, ancientgalaxy mergers would have created massive gravitational waves ? ripples in thevery fabric of space and time whose remnants should still be detectable today. New gravitational wave detectors, such as NASA's LaserInterferometer Space Antenna, were designed to spot these waves directly,opening a window into the workings of our cosmos. To interpret the results fromthese detectors, however, scientists will need to know how supermassive blackholes formed. The new computer simulations should provide a clue, theresearchers noted. The scientists detailed their findings Aug. 26 in the journalNature.